Loft insulation can pay for itself in a little over two years and reduce a home's annual carbon dioxide emissions by almost a tonne. That's because a house without loft insulation can lose 15 per cent of its heating costs through its roof. Simply installing blanket loft insulation at the recommended depth of 27 centimetres can slash bills by more than £100 a year. The initial cost involved for those handy at DIY is as little as £250 rising to around £500 to have it installed professionally. Even those who already have loft insulation can make considerable saving by topping it up to the recommended depth. In fact if everyone in the UK had loft insulation 27 centimetres deep the nationwide saving would be a staggering £380 million.Loft insulation works by stopping the upward movement of heated air and trapping heat in the house. The reduction in the loss of heat from rooms below means less energy is required. 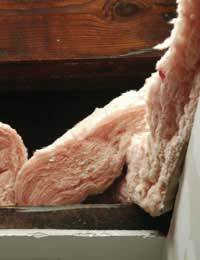 The most common and cheapest form of loft insulation is called blanket or rolled insulation. It is usually made from mineral wool or fibreglass and is fairly straightforward to install but it can irritate the skin so protective masks gloves and clothing should be worn. The insulation is laid between the joists on the floor of the loft and the joists themselves should then be covered if still visible. It is important the insulation is not compressed into eaves or tight corners and, if there is a cold water tank in the loft, care must be taken not to insulate below it. Lagging pipes and insulating water tanks can increase energy efficiency further and the loft hatch should be draught proofed and insulated where possible. Finally, walk boards can be laid over joists to provide safe access to water tanks. An alternative is granular or loose fill insulation. It is often made of cork or mineral wool and is useful if the loft has irregularly spaced joists. Blown fibre loft insulation is another option, although it has to be installed by a professional, and the more environmentally-friendly varieties of insulation, such as those made from sheep's wool, hemp or newspaper, come from renewable sources and take less energy to produce, but tend to be more expensive. There are even options for those keen to use their loft as a living space. A spray foam can be applied directly onto the underside of the roof slates, or sheet loft insulation can be installed in the sloping sides of the roof. Once installed, loft insulation can add value to a property and as well as keeping the home warmer during the winter months can help keep it cool during the summer. Grant assistance for installing loft insulation is available through the Government, energy suppliers and local authorities. Most local authorities offer grants and incentives to residents installing energy-efficient measures in their homes, while the biggest energy suppliers are obliged to meet targets under the Government's Energy Efficiency Commitment. Government funds provide grants, although the eligibility criteria differ between countries. The funds are called Warm Front in England, Warm Deal and the Central Heating Programme in Scotland, Warm Homes in Northern Ireland and the Home Energy Efficiency Scheme in Wales. Those who own their home or rent it from a private landlord may be eligible for a grant to cover between 30 and 70 per cent of the cost of loft insulation, while those in receipt of an income or disability benefit could be entitled to free loft insulation. @Una - your bungalow should be insulated by the builder to legislated requirements. @Williams- your new build property should conform to building insulation regs, which means you wouldn't need a grant and/or be eligible for one. Can we get the government grant for loft insulation on a new build property?